Mumbai: Mukesh Ambani is poised to overtake Alibaba Group founder Jack Ma to become Asia’s richest person as he positions Reliance Industries to disrupt the e-commerce space in India. The chairman of India’s refining-to-telecoms conglomerate Reliance Industries Ltd, Ambani was estimated to be worth $44.3 billion on Friday with Reliance trading 1.7% higher, according to Bloomberg Billionaires Index. The stock fetched ₹ 1,100.65 as of 12.25pm in Mumbai and is set for a record. Ma’s wealth stood at $44 billion at close of trade on Thursday in the US, where the company is listed. Ambani has added $4 billion to his fortune this year as Reliance doubled its petrochemicals capacity and investors cheered the success of his disruptive telecom upstart Reliance Jio Infocomm Ltd. Then earlier this month, the tycoon unveiled plans to leverage his 215 million telecom subscribers to expand his e-commerce offerings, taking on the likes of Amazon.com Inc. and Walmart Inc., Alibaba Group Holding Ltd.’s Ma has lost $1.4 billion in 2018. “We need to broaden our horizon of expectation with Reliance," said Nitin Tiwari, a Mumbai-based analyst at Antique Stock Broking. “They are in for something really transformational." At this month’s annual shareholders’ meeting, Ambani said Reliance saw its “biggest growth opportunity in creating a hybrid, online-to-offline new commerce platform," involving the group’s Reliance Retail Ltd. and Reliance Jio businesses. The latter will introduce a fiber-based broadband service across 1,100 Indian cities in August in what Ambani said would be the biggest greenfield fixed-line rollout anywhere in the world. A spokesman for Reliance didn’t immediately reply to an email seeking comment. 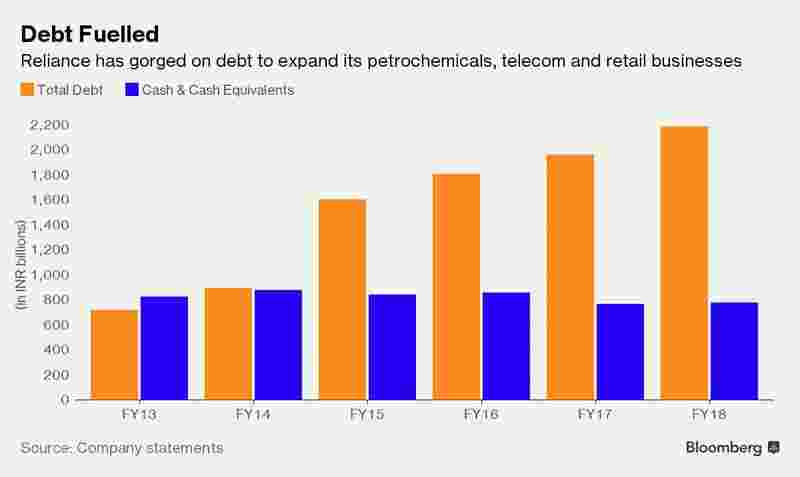 Within a week of the announcements, Reliance re-entered the $100 billion club after more than a decade. He used the same venue two years ago to announce his disruptive telecom venture with free offers that eventually forced smaller rivals to quit and the biggest ones to merge. The billionaire inherited Reliance from his much-storied father Dhirubhai Ambani, who is credited with sparking an equity culture among middle-class Indians and using their savings to build the group’s textile and petrochemical manufacturing units. Dhirubhai’s death in 2002 left the group in the hands of Mukesh and his younger brother Anil Ambani. The brothers eventually split the company in 2005, as per a family pact brokered by their mother, after years of acrimony.